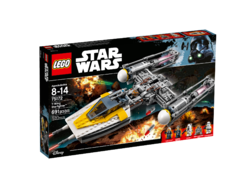 75172 Y-Wing Starfighter is a Star Wars set released in December 2016, and will be relased in North America in March 2017. Launch daring raids with the iconic Y-Wing Starfighter! Expand your Rebel fleet with the iconic Y-Wing Starfighter. The unmistakable workhorse of the Rebel Alliance has been faithfully reproduced with LEGO® bricks and features many play starters, including retractable landing gear, an opening minifigure cockpit, rotating guns, dual spring-loaded shooters, and gearwheel-operated bomb-drop function. This great model also comes with a weapons loader with turning crane and extra ammo for even more immersive play. 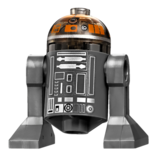 Includes four minifigures and a droid figure. 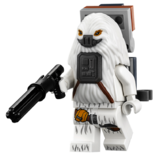 Includes four minifigures: a Y-Wing Pilot, Admiral Raddus, Moroff and a Stormtrooper, plus a Rebel Astromech droid figure. 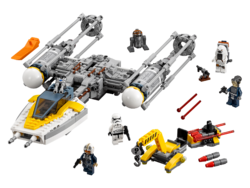 Features a Y-Wing Starfighter and a weapons loader. Y-wing features retracting landing gear, an opening minifigure cockpit, rotating guns, two spring-loaded shooters and bomb-drop function. Weapons loader features a movable crane and detachable ammo. Weapons include four bombs, two blaster pistols, a blaster and Moroff's backpack loaded with elements that can assemble to create his personal blaster. Operate the crane and lift the ammo into position. Turn the gearwheel to release the bombs. Y-Wing Starfighter measures over 2” (7cm) high, 16” (41cm) long and 7” (20cm) wide. Weapons loader measures over 3” (8cm) high, 6” (17cm) long and 2” (6cm) wide. The sticker applied to the ammunition cart that came with the new model Y-Wing has a sticker that says 'danger' in Aurebesh. Facts about "75172 Y-Wing Starfighter"
This page was last edited on 9 February 2019, at 22:06.